Enact Conveyancing’s Hull team expands to 50 after new office opening. Left to right: Lucy Sherliker (HR Manager), Lee Thrush (Operations Manager), Kelly Yates-Cuthbert (Director of Remortage Operations) and Rebecca Jordan (Customer Experience Manager) from Enact Conveyancing in the entrance to the new Hull office in The Maltings. 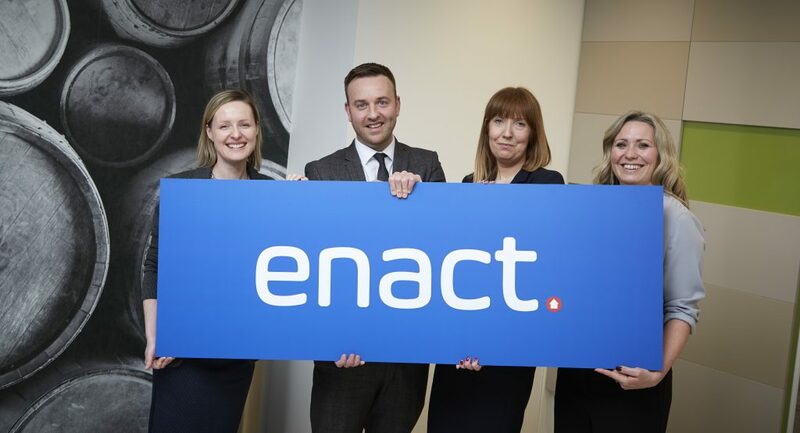 Leeds-based Enact Conveyancing, the largest direct conveyancing company in England and Wales, recently announced it has welcomed its 50th employee to its Hull team, after opening an office at The Maltings in March. The company hopes to recruit 100 additional people over the coming year to work at its Hull office. Roles to be filled include legal assistant, team leader, conveyancer and customer service advisor. Emily Settle (24) who lives in Princes Avenue, is the latest recruit to join the team. Emily explained: “Hull is a vibrant and diverse city, with so much going on, it’s great to see new businesses and job opportunities opening up. Established in 2000, Enact Conveyancing handles one in four remortgage conveyancing transactions and also helps thousands of people to move home each year. Since it was established, it has processed over 1.2 million transactions. To accommodate its growth, the company expanded its operations from West to East Yorkshire in March, choosing Hull as the location for its second office. Ben Carroll, Managing Director at Enact, said the reason for choosing Hull was that the city was buoyant following its year as the UK City of Culture. He explained: “We wanted to help bring business, investment and new opportunities to Hull, as well as tap into the talent here to establish our new team. The Hull team work nationwide, providing remortgages on properties across England and Wales. The quality of the team’s work has allowed the company to introduce work for two of its largest clients, both large mortgage lenders, into Hull. Developing staff is integral to the company, which is why it operates the innovative Conveyancing Academy, a robust training initiative in which staff members receive comprehensive legal training alongside invaluable on-the-job learning. The company employs more than 530 people at its head office in Leeds. The new Hull team is based in a 10,000 square-foot, state-of-the-art office at Anchor House in Silvester Street. These fully refurbished offices form part of the unique Maltings office complex, the former home of the Hull Brewery company, in the heart of Hull city centre. Be the first to comment on "Enact Conveyancing’s Hull team expands to 50 after new office opening."